In the 100 largest U.S. metropolitan areas, buying means lower housing costs by 52.3 percent in New Orleans and by about 14.4 percent in Honolulu. The driving force on why buying trumps renting in affordability is that mortgage rates are still low. But things are different for retirees, found Trulia. Retirees are better off renting than owning, the real estate site found. The reasons? Retirees are more likely to stay in the house longer (15 years instead of the average seven), put down a 20 percent downpayment, and generally fall in a lower tax bracket (15 percent instead of 25 percent). There is one exception to the rent-don’t-buy is better: Those who want to leave an inheritance to their heirs. If retirees don’t care about having equity in their home at the end of their life, renting is a better option. 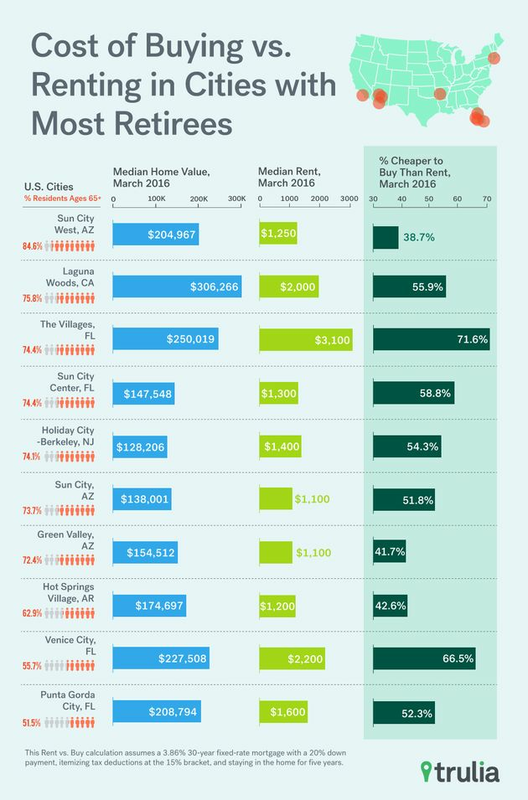 In every retiree city that Trulia examined, renting is a cheaper deal except in the major retirement communities like The Villages in Florida and Danville, Virginia.